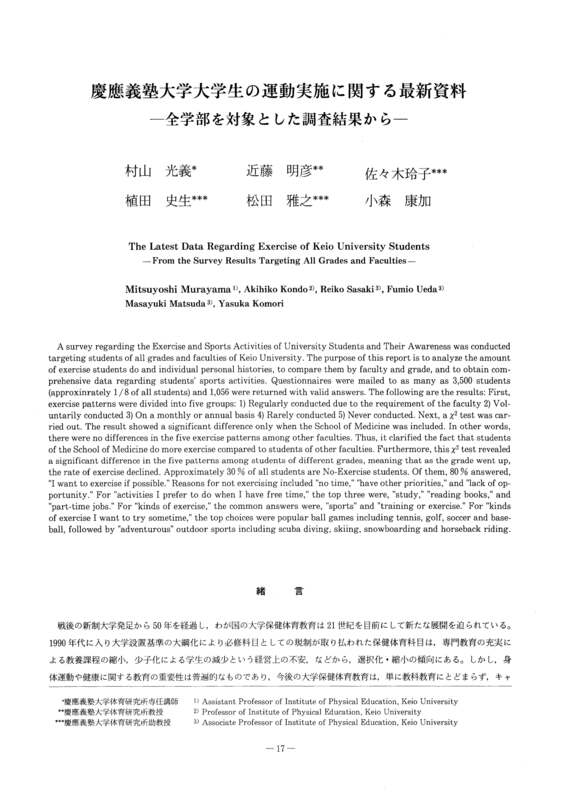 A survey regarding the Exercise and Sports Activities of University Students and Their Awareness was conducted targeting students of all grades and faculties of Keio University. The purpose of this report is to analyze the amount of exercise students do and individual personal histories, to compare them by faculty and grade, and to obtain comprehensive data regarding students' sports activities. Questionnaires were mailed to as many as 3,500 students (approxinrately 1/8 of all students) and 1,056 were returned with valid answers. The following are the results: First, exercise patterns were divided into five groups: 1) Regularly conducted due to the requirement of the faculty 2) Voluntarily conducted 3) On a monthly or annual basis 4) Rarely conducted 5) Never conducted. Next, a x2 test was carried out. The result showed a significant difference only when the School of Medicine was included. In other words, there were no differences in the five exercise patterns among other faculties. Thus, it clarified the fact that students of the School of Medicine do more exercise compared to students of other faculties. Furthermore, this x2 test revealed a significant difference in the five patterns among students of different grades, meaning that as the grade went up, the rate of exercise declined. Approximately 30 % of all students are No-Exercise students. Of them, 80% answered, "I want to exercise if possible." Reasons for not exercising included "no time, " "have other priorities, " and "lack of opportunity." For "activities I prefer to do when I have free time, " the top three were, " study, " "reading books, " and "part-time jobs." For "kinds of exercise," the common answers were "sports" and "training or exercise." For "kinds of exercise I want to try sometime, " the top choices were popular ball games including tennis, golf, soccer and baseball, followed by "adventurous" outdoor sports including scuba diving, skiing, snowboarding and horseback riding.